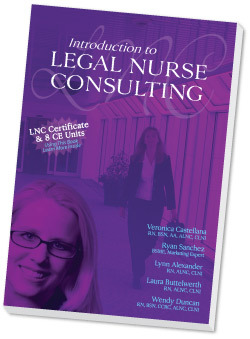 Learn some Legal Nurse Basics, Report Writing, and Case Analysis techniques that will provide an excellent foundation for any Legal Nurse Consulting path that you choose. 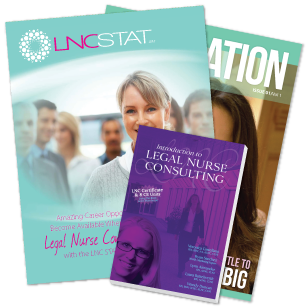 Get a small taste of the quality and comprehensiveness included with other LNC STAT certifications. Upgrade to a more advanced and comprehensive certification when you choose your desired path and want to ensure that you have all the training you need. Gain Continuing Education (CE) Units that can be used towards maintaining your RN licence in any state. If you are visiting this site, you may be ready for a change in your nursing career. You probably know that Legal Nurse Consulting may be a great choice, but you may have some hesitation or concerns. Maybe you are unsure if you are ready to commit completely, maybe you want to sample the training before you commit to a larger certification package, or maybe you want to get started but don't have the funds for a larger certification package. If you are finding yourself in one of these situations, this Legal Nurse Consulting (LNC) Certificate course is a great solution. Gain instant access to a free introduction book with 8 free CEUs and more information. After completing this course, you may decide you want more detailed training or a full certification. Upgrading is easy! Call to learn about your upgrade options. Click the "Compare Other Packages" button above to learn about more advanced certifications that you can upgrade to. Earn a nice chunk of contact hours to use towards your nursing license. These contact hours will be valid in all 50 states. Learn at home or on the go with the new mobile-friendly Online Portal. Training videos can be viewed on any desktop, laptop, tablet, and smart phone. It is compatible with both PC and Mac. Why Are Legal Nurse Consultants Needed? Who Can Legal Nurse Consultants Work For? What Types of Cases Can Legal Nurse Consultants Expect? Why Become an Independent Legal Nurse Consultant? What Makes Legal Nurse Consultants Successful? Use this step-by-step manual to learn how to create great looking reports using common software on your computer. Upgrade to a more advanced certification package to receive a more comprehensive version that includes how to work efficiently with paperless medical records. 15 downloadable templates that can be used when writing reports for your cases. Part of the Online Portal. Easily access thousands of medically-related links and resources that may be useful when working cases. Get real case experience and learn how to work a case from start to finish using real medical records, and learn how to create an impressive report with this introductory sample cases. After completing this case, you will be confident in your abilities and will know exactly how to review and write a report on your first case. Upgrade to a more advanced certification package to practice working with paperless medical records.